As a result of the growth in under floor heating we are receiving more enquiries regarding the use of CI+ matting when tiling on heated screeds. This is a rapidly growing sector of the market which offers good opportunities for extra sales when customers can be reassured that the tiled surface will be comfortable, warm and durable. The increased stress within the installation caused by thermal movement can cause problems to the installer. 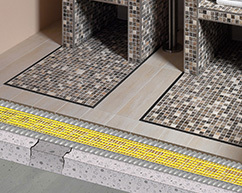 Separation or Isolation Membranes are ideal for removing shear stress from tiled installations. This removes a major obstacle to fixer confidence in installing these systems. CI+ matting is thermoconductivity neutral which means that the heat can pass through the mat – the mat is not an insulation layer. By absorbing this stress the membrane allows the tiled surface to remain intact. The air spaces under the membrane have two benefits, they allow residual moisture to gradually escape therefore helping to prevent cracks forming in the substrate. 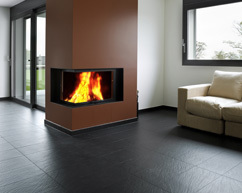 The air spaces also allow the heat to be spread evenly across the floor surface making the heating action more general and effective. These projects are technically more demanding, CI+ matting has to work as part of a technically correct installation. If a component is missing it cannot be expected to fulfil its proper function. Rule 1. Movement Joints. Heated screeds need more movement accommodation. The latest British Standard advise to install a Movement Joint to make bays of 40m2 or less with the longest side being 8m or less. This is in addition to those required at perimeters, across doorways and at changes in the substrate. Please note that although we supply movement joints this is not a sales ploy. They are vital for a successful installation. The matting MUST be split at the movement joint. A movement joint can be formed simply and cheaply for domestic installations by replacing the grout at that point with a suitable flexible compound, (NOT SILICONE – many adhesive and grout suppliers can provide a more durable alternative that matches their own grout products). Any pre existing Movement Joint in a sub floor must be carried directly through the tiled surface. Rule 2. Grout Lines. Use good quality flexible grout. There is a minimum requirement of a grout width of 3 – 4mm – Wider is better. On large format tiles this is even more important. Large format tiles, (those over 400mm x 400mm), especially need wider grout joints on heated screeds. Grout lines less than 3mm are not an option. Rule 3. As always – use good quality materials and maintain solid bedding for the tiled surface. CI matting requires no special precautions when used within a heated installation. 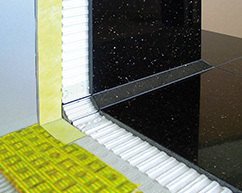 The only requirement is the selection of an adhesive suitable for use with the substrate. This adhesive must be capable of bonding to the substrate and achieving a mechanical fix with the fleece on the underside of CI matting. The electrical heating elements should be installed under the CI matting following the manufacturer’ instructions. Standard thin set adhesive can be used to fix tiles in place. A modified flexible grout should be used to complete the installation.